Every season brings it’s own inconveniences, and potentially costly fixes. Summer brings with it hot weather, and money spent on lotions whereas fall brings cool weather and fall clean up. What does winter bring? Winter brings snow and eggnog, but can also cause your pipes to freeze. 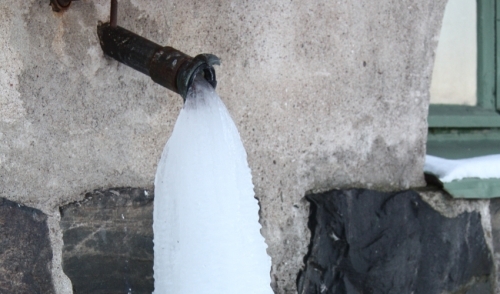 When water freezes in your pipes, it causes the water in the frozen pipes to expand and the pipes can burst. This means you may have to replace the pipe and repair any water damage the burst may have caused, which costs a lot of money. Check out these 5 tips to successfully thaw your pipes and avoid this disaster. The first tip to thawing your pipes is to turn on the hot and cold water dials. This will create a steady stream of water that will allow for the heating up of the pipes. Even though this steady stream may not run at first, the waters pressure will get better as the pipes are thawed. Be sure to do this process slowly, to fast could cause the pipes to burst. Second, you can use an electric blanket to thaw your pipes. This works better for big pipes or multiple pipes in an open area like your basement or garage. Plug in an electric blanket and let it warm up for several hours at it highest heat setting. After the blanket is heated up, wrap the blanket around the frozen pipes. Leave the blanket wrapped around the pipes until the blanket cools down. At this point your pipes should be thawed. If not, repeat the process. The third tip to thawing your frozen pipes is the good old-fashioned blow dryer. Depending on the size of the pipe this could be a very easy or very tiring process. When using a blow dryer to thaw frozen pipes, hold the blow dryer 10-12 inches away from the pipes. While you hold the blow dryer, move it over the area of the pipes until they are completely thawed. Fourth, heat the pipes using a space heater. This may sound simple enough, but it requires a lot of precautions. Be sure to keep the space heater at least one foot away from the pipes to avoid water exposure and accidental shock. Also make sure to move all flammable material to avoid causing a fire. Never leave a space heater unattended or use it in an attic. The final tip to thawing your pipes is to set the thermostat to 65 degrees Fahrenheit. This will reduce excessive energy, but it will also keep the pipes warm. Open the cabinets underneath the sink in your kitchen and bathroom to allow air to reach the pipes. This will help keep them from freezing. Although exposure to heat is necessary to thaw frozen pipes, make sure to choose the appropriate heat source to avoid injuries and damage to your pipes and home.